Artist Shana Smith moved to Spokane in 2015 and soon began exhibiting her work. In Perceptions of an Artist, which opens Jan. 5, exactly who is doing the perceiving? Do the artworks reflect the perceptions the artist has of us? Or of herself? Those type of questions get artist Shana Smith talking. "I'm obsessed with people," she says, "especially drawing them." Her list of obsessions is continuous: psychology, Da Vinci, communication, humanity, honesty, painting, art. Ever since she was a little girl growing up in Montana, she liked to draw, says Smith. The family's women were skilled at art — her aunts, mother and grandmother — and offered advice, solicited or not. "My grandmother told me there are no rules in art," she says, laughing. "She also told me I was doing [the artwork] wrong." Smith also remembers being told not to draw eyes first, that those were the hardest part, and not to draw people, which were harder still. She figured differently, revealing a gritty determination that's served her well. "If people are the hardest, and I can draw people," she says, "then I'll just focus on the hardest and everything else will be pretty easy." One senses that little in Smith's life has been easy, but art has been a grounding force. When she was little, says Smith, art could be a necessary escape. She didn't pursue art past high school, however, until she made a promise to her younger brother to enroll if he did so too. While bartending to support herself, she attended Flathead Community College, then University of Montana, earning her Bachelor of Fine Arts in painting. 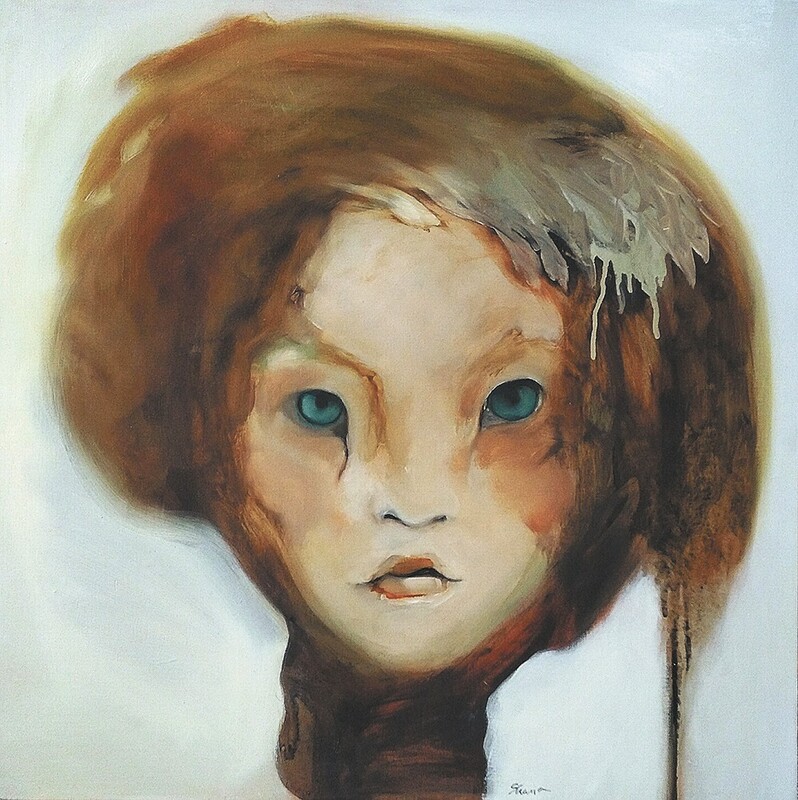 She relocated to Spokane in 2015 and found her groove, with artwork in the art magazine Art Chowder, exhibiting at Terrain 9 and numerous local venues, although at one of them (the now defunct Jones Radiator) her painting, "Unveiled" was stolen and remains unfound. Smith gave art lessons, did some painting for a local theme park and continues to do commissions. She also met Chris Komski, a fellow artist and musician, with whom she shares a home and strong bond. That, she says, allowed her to broach the idea of self-portraiture for Perceptions of An Artist. "It's the first time I've really been able to lock down the investigation of myself," says Smith. Last year, Smith participated in another exhibit at the Kolva-Sullivan Gallery, Behind Closed Doors, with the "I Am Not One" series. In it, seven female figures with animal heads represent the Seven Deadly Sins, as inspired by Leonardo da Vinci's notebooks on his bestiary or list of animals, usually fantastical. For both her recent series, Smith deliberately uses faces and bodies of anonymous figures in her work, making them less referential — to her or another specific person or time in history — and leans toward a muted, earth-tone palette. That elevates the use of the paint itself as an expressive tool. "My obsession is in style studies and the technical manipulation of paint," says Smith, who describes her growing "paint-language." Scrubby areas of paint, thin washes, expanses of matte color, subtle layering to build up translucence, and crisp whitish edges are all shorthand for Smith, not unlike the notes she writes to herself on the wall or jots in her journal. Another Shana Smith piece from Perceptions of an Artist, her show opening Jan. 5. What she's trying to communicate varies, of course, yet in Perceptions of an Artist, says Smith, she's really trying to connect with the viewer and convey complex and elusive things like emotion or states of being. For example, Smith employs nine stylized portraits of famous women to convey the varied and often conflicting perceptions she had of what it means/meant to be a woman: Janis Joplin, Jacqueline (Kennedy) Onassis, Marilyn Monroe, Rosa Parks, Frida Kahlo. Smith also identifies with "Protagonist," a figure with a gorilla head that references the Guerrilla Girls, a group of anonymous "feminist activist artists" that originated in New York City in the '80s. Other paintings in the exhibit offer a philosophical rabbit-hole. 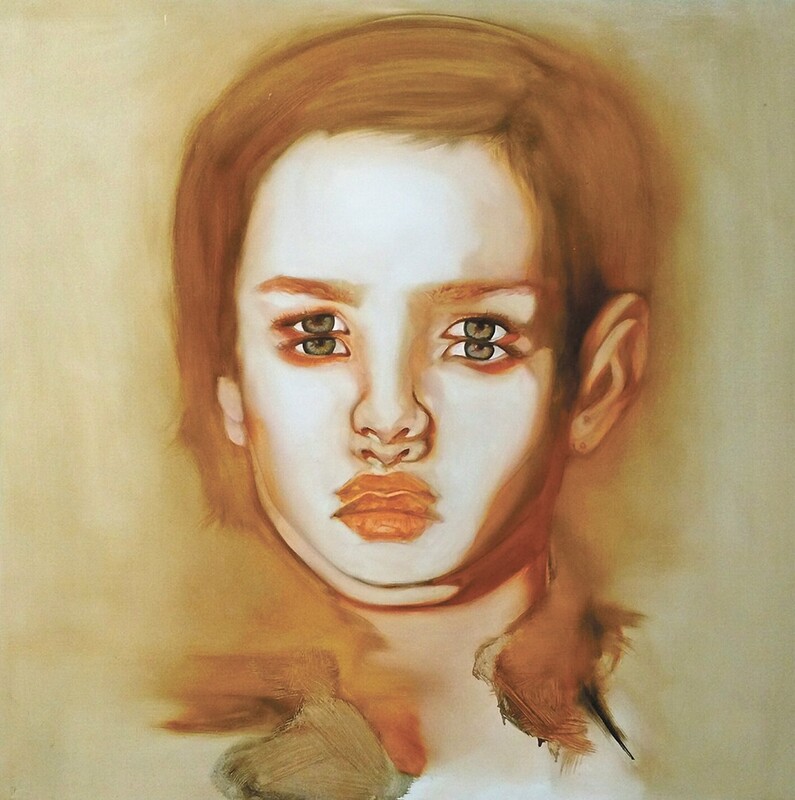 "Acatelepsy" is both disturbing and compellingly beautiful, the double-exposed eyes and mouth offset from each other, almost vibrating on the canvas, making it difficult to stare at for long. In the painting, the gamine face challenges the viewer, her plump mouth downturned at the corners, nostrils flared, her eyes somewhat hooded. What emotion or message does her face convey? Smith consults a dictionary to explain the title, which means incomprehensibility and "that human knowledge amounts only to probability and never to certainty." The original print version of this article was headlined "Matter of Perception"